Just bought the same fabric as #3 from The Designer's Attic so I'll definitely have one pillow down. I've been on the hunt for pillow covers for a while now and I still can't seem to decide on the 4-5 that I should buy. How can I choose just 4-5 pillow covers when I like so many? Do any of you have this problem too? What I'm specifically looking for are pillows to adorn our settee. At one point, I had decided to purchase all 4-5 pillow covers from Caitlin Wilson Textiles (love her stuff! ), but I thought about it and decided to mix it up a bit and see if there were other sources from which I could get pillow covers. And what better source than Etsy to help a girl out? 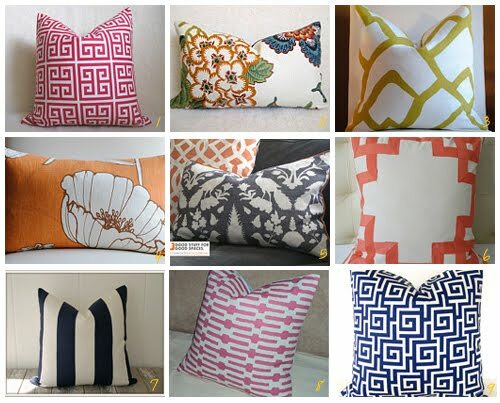 Here are some of my favorite pillow covers from Etsy sellers. Do you have any favorites?